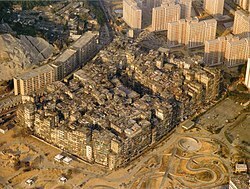 Kowloon Walled City was a largely ungoverned, densely populated settlement in Kowloon City, Hong Kong. Originally a Chinese military fort, the Walled City became an enclave after the New Territories was leased to Britain by China in 1898. Its population increased dramatically following the Japanese occupation of Hong Kong during World War II. By 1990, the walled city contained 50,000 residents within its 2.6-hectare (6.4-acre) borders. From the 1950s to the 1970s, it was controlled by local triads and had high rates of prostitution, gambling and drug abuse. In January 1987, the Hong Kong government announced plans to demolish the walled city. After an arduous eviction process, demolition began in March 1993 and was completed in April 1994. Kowloon Walled City Park opened in December 1995 and occupies the area of the former Walled City. Some historical artefacts from the walled city, including its yamen building and remnants of its southern gate, have been preserved there. The history of the walled city can be traced back to the Song Dynasty (960–1279), when an outpost was set up to manage the trade of salt. Little took place for hundreds of years afterward, although 30 guards were stationed there in 1668. A small coastal fort was established around 1810 after Chinese forces abandoned Tung Lung Fort. In 1842, during Qing Emperor Daoguang's reign, Hong Kong Island was ceded to Britain by the Treaty of Nanjing. As a result, the Qing authorities felt it necessary to improve the fort in order to rule the area and check further British influence. The improvements, including the formidable defensive wall, were completed in 1847. The walled city was captured by rebels during the Taiping Rebellion in 1854 before being retaken a few weeks later. The present Walled City's "Dapeng Association House" forms the remnants of what was previously Lai Enjue's garrison. 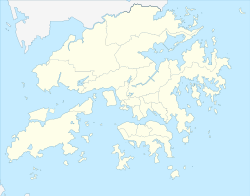 The Convention for the Extension of Hong Kong Territory of 1898 handed additional parts of Hong Kong (the New Territories) to Britain for 99 years, but excluded the walled city, which at the time had a population of roughly 700. China was allowed to continue to keep officials there as long as they did not interfere with the defence of British Hong Kong. The following year, the governor, Sir Henry Blake, suspected that the viceroy of Canton was using troops to aid resistance to the new arrangements. On 16 May 1899, British forces attacked the Walled City, only to find the viceroy's soldiers gone, leaving behind only the mandarin and 150 residents. The Qing dynasty ended its rule in 1912, leaving the walled city to the British. Though the British claimed ownership of the walled city, they did little with it over the following few decades. The Protestant church established an old people's home in the old "yamen" (Chinese administrative office) as well as a school and an almshouse in other former offices. 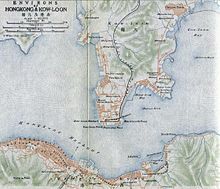 Aside from such institutions, however, the walled city became a mere curiosity for British colonials and tourists to visit; it was labelled as "Chinese Town" in a 1915 map. In 1933, the Hong Kong authorities announced plans to demolish most of the decaying walled city's buildings, compensating the 436 squatters that lived there with new homes. By 1940 only the yamen, the school and one house remained. During the World War II occupation of Hong Kong, the Japanese occupying forces demolished the city's wall and used the stone to expand the nearby Kai Tak Airport. After Japan's surrender in 1945, China announced its intent to reclaim the walled city. Refugees fleeing the Chinese Civil War post-1945 poured into Hong Kong, and 2,000 squatters occupied the walled city by 1947. After a failed attempt to drive them out in 1948, the British adopted a 'hands-off' policy in most matters concerning the walled city. Here, prostitutes installed themselves on one side of the street while a priest preached and handed out powdered milk to the poor on the other; social workers gave guidance while drug addicts squatted under the stairs getting high; what were children's games centres by day became strip-show venues by night. It was a very complex place, difficult to generalise about, a place that seemed frightening but where most people continued to lead normal lives. A place just like the rest of Hong Kong. The south side of the Kowloon Walled City in 1975. The elevation of the buildings begins to reach its maximum height. In January 1950, a fire broke out that destroyed over 2,500 huts, home to nearly 3,500 families and 17,000 total people. The disaster highlighted the need for proper fire prevention in the largely wooden-built squatter areas, complicated by the lack of political ties with the colonial and Chinese governments. The ruins gave new arrivals to the walled city the opportunity to build anew, causing speculation that the fire may have been intentionally set. With no government enforcement from the Chinese or the British aside from a few raids by the Royal Hong Kong Police, the walled city became a haven for crime and drugs. It was only during a 1959 trial for a murder that occurred within the Walled City that the Hong Kong government was ruled to have jurisdiction there. By this time, however, the walled city was virtually ruled by the organised crime syndicates known as triads. Beginning in the 1950s, triad groups such as the 14K and Sun Yee On gained a stranglehold on the walled city's numerous brothels, gaming parlours, and opium dens. The Walled City had become such a haven for criminals that police would venture into it only in large groups. It was not until 1973–74, when a series of more than 3,500 police raids resulted in over 2,500 arrests and over 1,800 kilograms (4,000 lb) of seized drugs, that the triads' power began to wane. With public support, particularly from younger residents, the continued raids gradually eroded drug use and violent crime. In 1983, the police commander of Kowloon City District declared the Walled City's crime rate to be under control. The City also underwent massive construction during the 1960s, with developers building new modular structures above older ones. The city became extremely densely populated and "a world unto its own,"an enclave. With over 33,000 people in 300 buildings occupying little more than 7 acres (2.8 ha). As a result, the city reached its maximum size by the late 1970s and early 1980s; a height restriction of 13 to 14 storeys had been imposed on the city due to the flight path of planes heading toward Kai Tak Airport. As well as limiting building height, the proximity of the airport subjected residents to serious noise pollution for the last 20 years of the city's existence. Eight municipal pipes provided water to the entire structure, although more could have come from wells. A few of the streets were illuminated by fluorescent lights, as sunlight rarely reached the lower levels due to the outstanding disregard to air rights within the city. Although the rampant crime of earlier decades diminished in later years, the walled city was still known for its high number of unlicenced doctors and dentists who could operate there without threat of prosecution. Although the walled city was for many years a hotbed of criminal activity, most residents were not involved in any crime and lived peacefully within its walls. 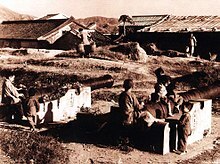 Numerous small factories and businesses thrived inside the walled city, and some residents formed groups to organise and improve daily life there. An attempt by the government in 1963 to demolish some shacks in a corner of the City gave rise to an "anti-demolition committee" that served as the basis for a kaifong association. Charities, religious societies, and other welfare groups were gradually introduced to the city. While medical clinics and schools went unregulated, the Hong Kong government provided some services such as water supply and mail delivery. Over time, both the British and the Chinese governments found the City to be increasingly intolerable despite a reduction in the reported crime rate. The quality of life in the city—sanitary conditions in particular—remained far behind the rest of Hong Kong. The Sino-British Joint Declaration in 1984 laid the groundwork for the city's demolition. The mutual decision by the two governments to tear down the Walled City was announced on 14 January 1987. On 10 March 1987, following the announcement that the walled city would be converted to a park, the Secretary for District Administration formally requested the Urban Council agree to take over the site following demolition. Owing to the presence of numerous other green spaces in the area, the Urban Services Department doubted the need for "yet another park" from a planning and operations point of view, but the council agreed nonetheless to accept the government's proposal on the condition that the government bear the cost of park construction. The government distributed some HK$2.7 billion (US$350 million) in compensation to the estimated 33,000 residents and businesses in a plan devised by a special committee of the Hong Kong Housing Authority. Some residents were not satisfied with the compensation and were forcibly evicted between November 1991 and July 1992. While it was deserted, the empty city was used to film a scene in the 1993 movie Crime Story. After four months of planning, demolition of the walled city began on 23 March 1993 and concluded in April 1994. Construction work on Kowloon Walled City Park started the following month. For details on the park itself, see Kowloon Walled City Park. The area where the walled city once stood is now Kowloon Walled City Park, adjacent to Carpenter Road Park. The 31,000 m2 (330,000 sq ft) park was completed in August 1995 and handed over to the Urban Council. It was opened officially by Governor Chris Patten a few months later on 22 December. Construction of the park cost a total of HK$76 million. The park's design is modelled on Jiangnan gardens of the early Qing Dynasty. It is divided into eight landscape features, with the fully restored yamen as its centrepiece. The park's paths and pavilions are named after streets and buildings in the Walled City. Artefacts from the walled city, such as five inscribed stones and three old wells, are also on display in the park. The park was designed by the Architectural Services Department, which won a "prestigious award" from the Central Society of Horticulture of Germany for the redevelopment. The yamen and the remains of the South Gate (see below). The Antiquities and Monuments Office conducted archaeological examinations as the walled city was being demolished, and several cultural remains were discovered. 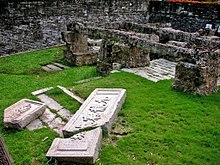 Among them were the walled city's yamen and remnants of its South Gate, which were officially designated declared monuments of Hong Kong on 4 October 1996. The South Gate had originally served as the walled city's main entrance. Along with its foundation, other remains included two stone plaques inscribed with "South Gate" and "Kowloon Walled City" from the South Gate and a flagstone path that had led up to it. The foundations of the City's wall and East Gate were also discovered. 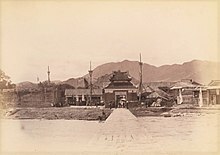 The Hong Kong government preserved the South Gate remnants next to a square in front of the yamen. The yamen building is made up of three halls. Originally the middle hall served the Assistant Magistrate of Kowloon's administrative office, and the rear block was his residence. After the government officials left the area in 1899, it was used for several other purposes, including an old people's home, a refuge for widows and orphans, a school, and a clinic. It was restored in 1996 and is now found near the centre of the park. It contains a photo gallery of the Walled City, and two cannon dating back to 1802 sit at the sides of its entrance. The walled city was located in what became known as the Kowloon City area of Kowloon. In spite of its transformation from a fort into an urban enclave, the walled city retained the same basic layout. The original fort was built on a slope and consisted of a 2.6-hectare (0.010 sq mi) plot measuring about 210 by 120 metres (690 by 390 ft). The stone wall surrounding it had four entrances and measured 4 metres (13 ft) tall and 4.6 metres (15 ft) thick before it was dismantled in 1943. 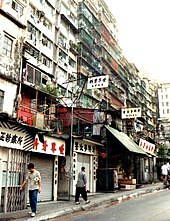 The Kowloon Walled City in 1989. Construction surged dramatically during the 1960s and 1970s, until the formerly low-rise City consisted almost entirely of buildings with 10 storeys or more (with the notable exception of the yamen in its centre). However, due to the Kai Tak Airport's position 800 metres (0.50 mi) south of the City, buildings did not exceed 14 storeys. The two-storey Sai Tau Tsuen settlement bordered the Walled City to the south and west until it was cleared in 1985 and replaced with Carpenter Road Park. The City's dozens of alleyways were often only 1–2 m (3.3–6.6 ft) wide, and had poor lighting and drainage. An informal network of staircases and passageways also formed on upper levels, which was so extensive that one could travel north to south through the entire City without ever touching solid ground. Construction in the City went unregulated, and most of the roughly 350 buildings were built with poor foundations and few or no utilities. Because apartments were so small—a typical unit was 23 m2 (250 sq ft)—space was maximised with wider upper floors, caged balconies and rooftop additions. Roofs in the City were full of television antennae, clothes lines, water tanks and rubbish, and could be crossed using a series of ladders. A street at the edge of the city at night. 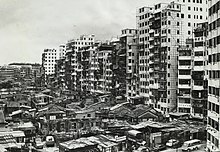 Kowloon Walled City's early population fluctuated between zero and a few hundred, and began growing steadily shortly after World War II. However, there is no accurate population information available for much of the Walled City's later existence. Official census numbers estimated the Walled City's population at 10,004 in 1971 and 14,617 in 1981, but these figures were commonly considered to be much too low. Informal estimates, on the other hand, often mistakenly included the neighbouring squatter village of Sai Tau Tsuen. Population figures of about 50,000 were also reported. A thorough government survey in 1987 gave a clearer picture: an estimated 33,000 people resided within the Walled City. Based on this survey, the Walled City had a population density of approximately 1,255,000 inhabitants per square kilometre (3,250,000/sq mi) in 1987, making it the most densely populated spot in the world. A playground at the edge of the city. In response to difficult living conditions, residents formed a tightly knit community, helping one another endure various hardships. Within families, wives often did housekeeping, while grandmothers cared for their grandchildren and other children from surrounding households. The City's rooftops were an important gathering place, especially for residents who lived on upper floors. Parents used them to relax, and children would play or do homework there after school. The yamen in the heart of the City was also a major social centre, a place for residents to talk, have tea or watch television, and to take classes such as calligraphy. The Old People's Centre also held religious meetings for Christians and others. Other religious institutions included the Fuk Tak and Tin Hau temples, which were used for a combination of Buddhist, Taoist, and animist practices. A few of the people who spent time in Kowloon Walled City have written accounts of their experiences. Evangelist Jackie Pullinger wrote a 1989 memoir, Crack in the Wall, about her involvement in treating drug addicts within the Walled City. In his 2004 autobiography Gweilo, Martin Booth describes his exploration of the Walled City as a child in the 1950s. The Walled City of Kowloon has no visible wall around it, but it is as clearly defined as if there were one made of hard, high steel. It is instantly sensed by the congested open market that runs along the street in front of the row of dark run-down flats—shacks haphazardly perched on top of one another giving the impression that at any moment the entire blighted complex will collapse under its own weight, leaving nothing but rubble where elevated rubble had stood. Many authors, filmmakers, game designers, and visual artists have used the Walled City to convey a sense of oppressive urbanisation or unfettered criminality. In literature, Robert Ludlum's novel The Bourne Supremacy uses the Walled City as one of its settings. The City appears as a virtual reality environment (described by Steven Poole as an "oasis of political and creative freedom") in William Gibson's Bridge trilogy, and as a contrast with Singapore in his Wired article "Disneyland with the Death Penalty". In the manga Crying Freeman, the titular character's wife travels to the Walled City to master her swordsmanship and control a cursed sword. The manga Blood+: Kowloon Nights uses the Walled City as the setting for a series of murders. The Walled City finds an extensive mention in Doctor Robin Cook's 1991 novel Vital Signs. The filth, squalor and the crime-oriented nature of the area is described vividly when the characters Marissa and Tristan Williams pass by the back-lanes. The later part of episode 3 and episode 4 of the anime Street Fighter II V are set in the Kowloon Walled City, depicted as a dark and lawless area where Ryu, Ken and Chun-Li have to fight for their lives at every turn, being rescued by the police once they reach the Walled City's limits. In the collaborative fiction website SCP Foundation there is the article named "SCP-184", describing an object also known as "The Architect", with the power to make buildings grow in size and complexity in the inside without altering the outside of the building. The article narrates the search for the objects as it is hidden by inhabitants in Kowloon Walled City. The 1982 Shaw Brothers film Brothers from the Walled City is set in Kowloon Walled City. The 1984 gangster film Long Arm of the Law features the Walled City as a refuge for gang members before they are gunned down by police. In the 1988 film Bloodsport, starring Jean-Claude Van Damme, the Walled City is the setting for a martial arts tournament. The 1992 non-narrative film Baraka features several highly detailed shots of the Walled City shortly before its demolition. The 1993 film Crime Story starring Jackie Chan was partly filmed in the deserted Walled City, and includes real scenes of building explosions. A walled neighbourhood called the Narrows in the 2005 film Batman Begins was inspired by the Walled City. 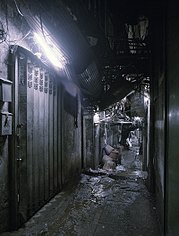 The 2006 Hong Kong horror film Re-cycle features a decrepit, nightmarish version of the Walled City, complete with tortured souls from which the protagonist must flee. The 2016 TVB martial arts drama A Fist Within Four Walls takes place in the Triad-ridden Walled City in the early 1960s. Hive of dream. Those mismatched, uncalculated windows. How they seemed to absorb all the frantic activity of Kai Tak airport, sucking in energy like a black hole. —William Gibson, "Disneyland with the Death Penalty"
Kowloon Walled City is depicted in several games, including Kowloon's Gate, Shenmue II and Call of Duty: Black Ops. The game Stranglehold, a sequel to the film Hard Boiled, features a version of the Walled City filled with hundreds of Triad members. In the games Fear Effect and Fear Effect 2, photographs of the Walled City were used as inspiration "for moods, camera angles and lighting." Concept art for the MMORPG Guild Wars: Factions depicts massive, densely packed structures inspired by the Walled City. The pen-and-paper RPG Shadowrun and CRPG Shadowrun: Hong Kong include a crime-ridden, rebuilt version of the Walled City set in 2056. 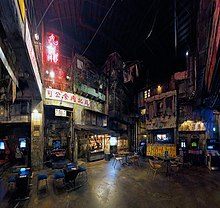 A partial recreation of the Kowloon Walled City exists in the Anata No Warehouse, an amusement arcade that opened in 2009 in the Japanese suburb of Kawasaki, Kanagawa. The designer's desire to accurately replicate the atmosphere of the Walled City is reflected in the arcade's narrow corridors, electrical wires, pipes, postboxes, sign boards, neon lights, frayed posters, and various other small touches that provide an air of authenticity. Dharavi, a densely populated community within Mumbai which has developed a similar localized economy and unplanned infrastructure system. ^ a b c Owen, Pamela (5 May 2012). 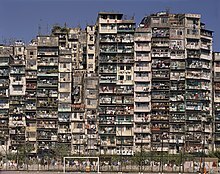 "Inside the Kowloon Walled City where 50,000 residents eked out a grimy living in the most densely populated place on earth". The Daily Mail. London. Retrieved 6 April 2014. ^ a b c d e f g h i j Wilkinson, Julia. "A Chinese Magistrate's Fort". City of Darkness: Life in Kowloon Walled City. pp. 60–71. ISBN 978-1-8732-0013-1. ^ a b Sinn, Elizabeth. "Kowloon Walled City: Its Origin and Early History" (PDF). Journal of the Hong Kong Branch of the Royal Asiatic Society. 27: 30–31. Archived from the original (PDF) on 30 April 2011. Retrieved 25 November 2009. ^ Li Long Lam, Excavation Report of Kowloon Walled City, Hong Kong(香港九龙寨城发掘简报)", in Kaogu, vol. 6, 2007. ^ Kwan, Leung Ping. "The Walled City: Our Place". 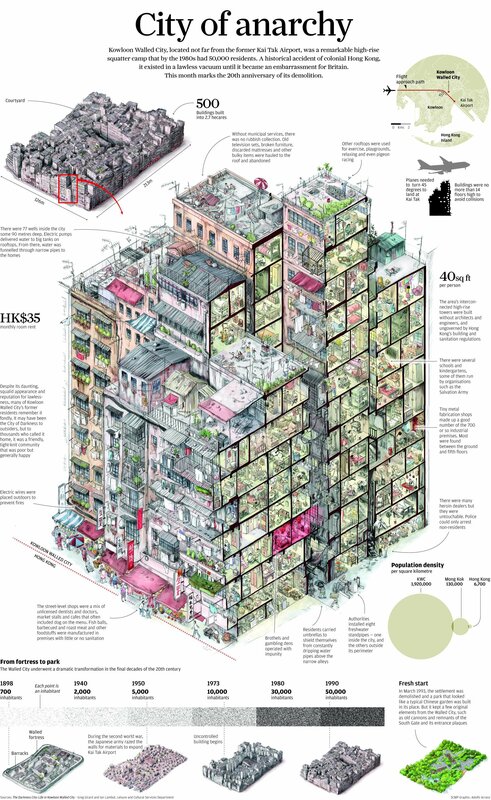 City of Darkness: Life in Kowloon Walled City. pp. 120–23. ^ Booth, Martin (14 November 2006). Golden Boy: Memories of a Hong Kong Childhood. St. Martin's Press. p. 131. ISBN 978-1-4668-1858-3. ^ Carney, John (16 March 2013). "Kowloon Walled City: Life in the City of Darkness". South China Morning Post. Retrieved 29 January 2014. ^ Harter, Seth (November 2000). "Hong Kong's Dirty Little Secret". Journal of Urban History. 27 (1): 92–113. doi:10.1177/009614420002700106. ISSN 0096-1442. ^ Goddard, Charles (September 2007). "The Water Supply". City of Darkness: Life in Kowloon Walled City. pp. 36–38. ^ a b Basler, Barbara (16 June 1992). "The Walled City, Home to Huddled Masses, Falls". The New York Times. p. A4. Retrieved 27 November 2009. ^ a b c d Goddard, Charles. "The Clearance". City of Darkness: Life in Kowloon Walled City. pp. 208–11. ^ a b c d "Kowloon Walled City Park – History/Background". Leisure and Cultural Services Department. 21 October 2004. Archived from the original on 7 February 2010. Retrieved 6 November 2009. ^ Flint, John (23 December 1995). "Walled City's transformation sparks hopes for other sites". South China Morning Post. Retrieved 28 January 2014. ^ a b "The Yamen". Leisure and Cultural Services Department. 21 October 2004. Archived from the original on 23 November 2009. Retrieved 17 November 2009. ^ Ng, Kang-Chung (12 January 1994). "Walled City park project wins top award". South China Morning Post. ^ "Eight Floral Walks". Leisure and Cultural Services Department. 21 October 2004. Archived from the original on 13 November 2009. Retrieved 16 November 2009. ^ "The Chess Garden". Leisure and Cultural Services Department. 21 October 2004. Archived from the original on 1 November 2009. Retrieved 16 November 2009. ^ "The Garden of Chinese Zodiac". Leisure and Cultural Services Department. 21 October 2004. Archived from the original on 13 November 2009. Retrieved 16 November 2009. ^ "The Garden of Four Seasons". Leisure and Cultural Services Department. 21 October 2004. Archived from the original on 13 November 2009. Retrieved 16 November 2009. ^ "Kuixing Pavilion and Guibi Rock". Leisure and Cultural Services Department. 21 October 2004. Archived from the original on 13 November 2009. Retrieved 16 November 2009. ^ "The Mountain View Pavilion". Leisure and Cultural Services Department. 21 October 2004. Archived from the original on 25 November 2009. Retrieved 16 November 2009. ^ "Layout Plan". Leisure and Cultural Services Department. 21 October 2004. Archived from the original on 23 November 2009. Retrieved 19 November 2009. ^ "The Geographical Information System on Hong Kong Heritage". Leisure and Cultural Services Department. Retrieved 19 November 2009. ^ "Annex I Listing of Declared Monuments". Environmental Protection Department. 28 April 2006. Archived from the original on 28 December 2009. Retrieved 6 November 2009. ^ "The Old South Gate". Leisure and Cultural Services Department. 21 October 2004. Archived from the original on 24 November 2009. Retrieved 19 November 2009. ^ "Former Yamen Building of Kowloon Walled City, Kowloon Walled City Park". Leisure and Cultural Services Department. 5 February 2009. Archived from the original on 3 November 2009. Retrieved 22 October 2009. ^ Girard, Greg. "Foreword". City of Darkness: Life in Kowloon Walled City. p. 7. ^ a b Wesley-Smith, Peter (1998). Unequal treaty, 1898–1997: China, Great Britain, and Hong Kong's new territories (rev. ed.). Hong Kong: Oxford University Press. pp. 189–90. ISBN 0-19-590354-4. ^ Popham, Peter. "Introduction". 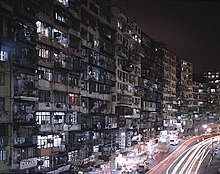 City of Darkness: Life in Kowloon Walled City. pp. 9–13. ^ Siu-Fong, Betty Ho (1986). Redevelopment of Kowloon Walled City: A Feasibility Study (PDF). University of Hong Kong. p. 52. OCLC 52017240. Retrieved 11 March 2014. ^ "17 Most Densely Populated Places on Earth". kickassfacts.com. 26 October 2013. ^ Pullinger, Jackie; Danziger, Nick (1 May 1989). Crack in the Wall. Hodder & Stoughton Religious. ISBN 978-0-340-49067-9. ^ a b c McDonogh, Gary; Wong, Cindy (30 August 2005). Global Hong Kong. Routledge. pp. 27–28. ISBN 978-0-415-94770-1. ^ a b Ludlum, Robert (March 1987). The Bourne Supremacy. Bantam Books. ISBN 0-553-26322-6. ^ Poole, Steven (3 May 2009). "Tomorrow's man". The Guardian. London. Retrieved 15 October 2009. ^ a b Gibson, William (September – October 1993). "Disneyland with the Death Penalty". Wired. Condé Nast. 1 (4). Retrieved 16 November 2009. ^ Bartholow, Michael (4 October 2006). "Crying Freeman Volume 3 TPB". Advanced Media Network. Retrieved 26 October 2009. ^ "Blood+: Kowloon Nights". Dark Horse Comics. Retrieved 26 October 2009. ^ "SCP-184 - The Architect, a fantastic horror story in Kowloon Walled City". ^ "Review of ''Brothers from the Walled City''". Sogoodreviews.com. Retrieved 11 March 2014. ^ "New Age Timeout". BD: New Age. 19 May 2005. Archived from the original on 20 June 2008. Retrieved 21 October 2009. ^ Strother, Barbara. "Kowloon Walled City Park Information". Home & Abroad. Archived from the original on 22 July 2011. Retrieved 27 October 2009. ^ Otto, Jeff (6 June 2005). "Interview: Christopher Nolan". IGN. Retrieved 15 October 2009. ^ Shingleton, Matt (12 September 2006). "Re-Cycle". The DVD Times. Retrieved 17 October 2009. ^ TVB 周刊 #950 新劇解構" [TVB Weekly, #950; New drama explained]. TVB Weekly (in Chinese). TVB. 7 September 2015. ^ a b McMillan, Fraser (7 September 2009). "Stranglehold". Thunderbolt. Retrieved 24 October 2009. ^ Lui, Chi Kong (4 April 2001). "Interview with Stan Liu – Part 1". Game Critics. Retrieved 24 October 2009. ^ "ArenaNet Art Director Daniel Dociu wins Spectrum 14 gold medal!". Guild Wars. 9 March 2007. Retrieved 24 October 2009. ^ Boyle, Rob (17 July 2006). Shadowrun: Runner Havens. Fanpro. pp. 13, 26. ISBN 978-1-932564-68-6. Archived from the original on 23 January 2009. Retrieved 17 October 2009. ^ Ryall, Julian (1 October 2013). "Arcade brings Kowloon Walled City back from the dead... in Japan". South China Morning Post. Retrieved 27 April 2014. Cite error: A list-defined reference named "p90" is not used in the content (see the help page). Lambot, Ian (September 2007). City of Darkness: Life in Kowloon Walled City. Watermark. ISBN 978-1-873200-13-1. Smart, Alan (1 June 2006). The Shek Kip Mei Myth: Squatters, Fires and Colonial Rule in Hong Kong, 1950–1963. Hong Kong University Press. ISBN 978-962-209-792-6. Official website for Kowloon Walled City Park, Leisure and Cultural Services Department (LCSD).